2013- Technical advisor of IndoorAtlas Ltd.
2002-2007 R&D Manager, Indagon Ltd.
2000-2002 Research Engineer, Nokia Ltd.
Simo Särkkä received his Master of Science (Tech.) degree (with distinction) in engineering physics and mathematics, and Doctor of Science (Tech.) degree (with distinction) in electrical and communications engineering from Helsinki University of Technology, Espoo, Finland, in 2000 and 2006, respectively. From 2000 to 2010 he worked with Nokia Ltd., Indagon Ltd., and Nalco Company in various industrial research projects related to telecommunications, positioning systems, and industrial process control. From 2010 to 2013 he worked as a Senior Researcher with the Department of Biomedical Engineering and Computational Science (BECS) at Aalto University, Finland. 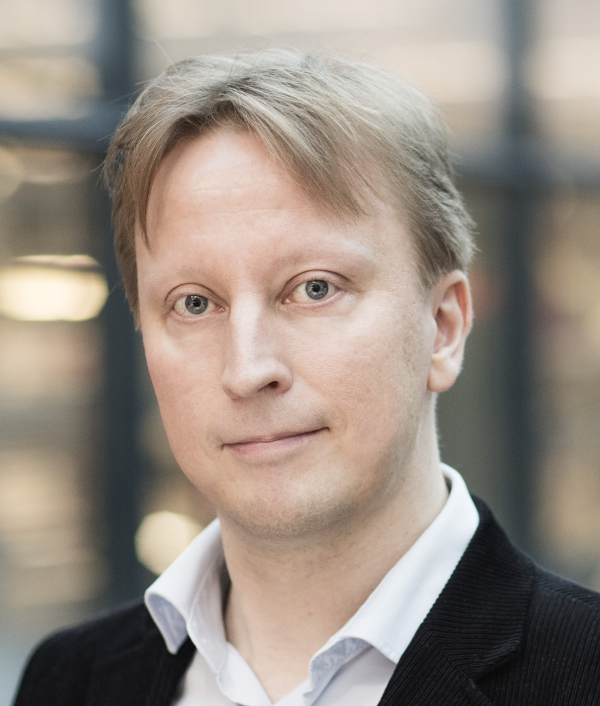 Currently, Dr. Särkkä is an Associate Professor with Aalto University, Technical Advisor of IndoorAtlas Ltd., and an Adjunct Professor with Tampere University of Technology and Lappeenranta University of Technology. In 2013 he was a Visiting Professor with the Department of Statistics of Oxford University and in 2011 he was a Visiting Scholar with the Department of Engineering at the University of Cambridge, UK. His research interests are in multi-sensor data processing systems with applications in location sensing, health and medical technology, machine learning, inverse problems, and brain imaging. He has authored or coauthored over 100 peer-reviewed scientific articles and his book "Bayesian Filtering and Smoothing" along with its Chinese translation were recently published via the Cambridge University Press. He is a Senior Member of IEEE and serving as an Associate Editor of IEEE Signal Processing Letters. Spatio-temporal modeling in machine learning, inverse problems, and Kriging. Location sensing, target tracking, audio signal processing. Applications in medicine, biology, RF/RFID systems, telematics, optical/video tracking, inertial navigation, robotics, audio systems, etc. State-space, sparse, and reduced rank methods in Gaussian process regression. Stochastic partial/pseudo differential equations (SPDE). Infinite-dimensional/distributed-parameter Kalman filtering and smoothing. The PDF preprints below are draft versions of the articles and they are here to give people an opportunity to check the relevance of the articles before purchasing the final articles from the publisher. Please send me an email if you want the latest preprints of the submitted articles. Coming soon: Simo Särkkä and Arno Solin (2019). Applied Stochastic Differential Equations. Cambridge University Press. Soon available from Cambridge University Press at this link. Once published, the book will be available here in PDF form as well. Simo Särkkä (2013). 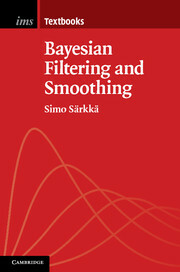 Bayesian Filtering and Smoothing. Cambridge University Press. Available from Cambridge University Press at http://www.cambridge.org/sarkka, from this CUP-link, or from, e.g., Amazon UK or Amazon USA. This PDF version is made available for personal use. The copyright in all material rests with the author (Simo Särkkä). Commercial reproduction is prohibited, except as authorised by the author and publisher. 希莫•萨日伽 (2015). 贝叶斯滤波与平滑. 国防工业出版社. Chinese translation of "Bayesian filtering and smoothing". Available, e.g., from Amazon China. Ángel F. García-Fernández, Filip Tronarp, Simo Särkkä. Gaussian target tracking with direction-of-arrival von Mises-Fisher measurements. Accepted for publication in IEEE Transactions on Signal Processing. Filip Tronarp, Ángel F. García-Fernández, and Simo Särkkä (2018). Iterative Filtering and Smoothing In Non-Linear and Non-Gaussian Systems Using Conditional Moments. IEEE Signal Processing Letters, Volume 25, Issue 3, Pages 408-412 (DOI, Preprint). Ángel F. García-Fernández, Lennart Svensson, Simo Särkkä (2017). Iterated posterior linearisation smoother. IEEE Transactions on Automatic Control, Volume 62, Issue 4. (DOI, Preprint). S. Särkkä and J. Hartikainen (2010). On Gaussian Optimal Smoothing of Non-Linear State Space Models. IEEE Transactions on Automatic Control, Volume 55, Issue 8, Pages 1938-1941. (DOI, Preprint, Matlab toolbox). See also errata DOI or Preprint. Kimmo Suotsalo, Simo Särkkä (2018). On-Line Bayesian Parameter Estimation In Electrocardiogram State Space Models. In Proceedings of IEEE International Workshop on Machine Learning for Signal Processing (MLSP). Rui Gao, Filip Tronarp, Simo Särkkä (2018). Combined Analysis-l1 and Total Variation ADMM with Applications to MEG Brain Imaging and Signal Reconstruction. In Proceedings of European Signal Processing Conference (EUSIPCO). Roland Hostettler, Tuomas Lumikari, Lauri Palva, Tuomo Nieminen, Simo Särkkä (2018). Motion Artifact Reduction in Ambulatory Electrocardiography Using Inertial Measurement Units and Kalman Filtering. In Proceedings of International Conference on Information Fusion (FUSION). R. Hostettler, F. Tronarp, and S. Särkkä. Modeling the drift function in stochastic differential equations using reduced rank Gaussian processes. In Proceedings of 18th IFAC Symposium on System Identification (SYSID), Stockholm, Sweden, July 2018. Olli-Pekka Rinta-Koski, Simo Särkkä, Jaakko Hollmén, Markus Leskinen, Krista Rantakari and Sture Andersson (2017). Prediction of major complications affecting very low birth weight infants . In Proceedings of IEEE Life Sciences Conference (LSC). R. Hostettler, S. Särkkä, and S. J. Godsill (2017).Rao–Blackwellized particle MCMC for parameter estimation in spatio-temporal Gaussian processes. In Proceedings of 27th IEEE International Workshop on Machine Learning for Signal Processing (MLSP), Tokyo, Japan, September 2017. R. Hostettler, O. Kaltiokallio, H. Yiğitler, S. Särkkä, and R. Jäntti (2017). RSS-based respiratory rate monitoring using periodic Gaussian processes and Kalman filtering In Proceedings of the 25th European Signal Processing Conference (EUSIPCO), Kos, Greece, August 2017. Olli-Pekka Rinta-Koski, Simo Särkkä, Jaakko Hollmén, and Sture Andersson (2017). Prediction of preterm infant mortality with Gaussian process classification.In Proceedings of 25th European Symposium on Articial Neural Networks, Computational Intelligence and Machine Learning (ESANN 2017). Narayan Puthanmadam Subramaniyam, Filip Tronarp, Simo Särkkä and Lauri Parkkonen (2017). Expectation–maximization algorithm with a nonlinear Kalman smoother for MEG/EEG connectivity estimation. In Proceedings of EMBEC'17. Toni Karvonen, Arno Solin, Ángel F. García-Fernández, Filip Tronarp, Simo Särkkä, and Fa-Hsuan Lin (2017). Where is Physiological Noise Lurking in k-Space? In Proceedings of ISMRM 2017. Roland Hostettler and Simo Särkkä (2016). IMU and Magnetometer Modeling for Smartphone-based PDR. In Proceedings of IPIN. Toni Karvonen and Simo Särkkä (2016). Approximate state-space Gaussian processes via spectral transformation. In Proceedings of IEEE International Workshop on Machine Learning for Signal Processing (MLSP). Jakub Prüher and Simo Särkkä (2016). On The Use Of Gradient Information In Gaussian Process Quadratures. In Proceedings of IEEE International Workshop on Machine Learning for Signal Processing (MLSP). The best student paper award winner. Toni Karvonen and Simo Särkkä (2016). Fourier-Hermite Series for Stochastic Stability Analysis of Non-Linear Kalman Filters. In Proceedings of International Conference on Information Fusion (FUSION). Jayaprasad Bojja, Jussi Collin, Simo Särkkä, and Jarmo Takala (2015). Pedestrian Localization in Moving Platforms Using Dead Reckoning, Particle Filtering and Map Matching. In Proceedings of International Conference on Acoustics, Speech and Signal Processing (ICASSP). A. Solin, S. Särkkä, A. Nummenmaa, A. Vehtari, T. Auranen, F.-H. Lin (2014). Catching Physiological Noise: Comparison of DRIFTER in Image and k-Space. In Proceedings of ISMRM 2014 (abstract and poster). X. Chen, S. Särkkä, and S. Godsill (2013). Probabilistic Initiation and Termination for MEG Multiple Dipole Localization Using Sequential Monte Carlo Methods. In Proceedings of International Conference on Information Fusion (FUSION). A. Solin, E. Glerean, and S. Särkkä (2013). Time-Frequency Dynamics of Brain Connectivity by Stochastic Oscillator Models and Kalman Filtering. In Proceedings of OHBM 2013 (abstract and poster). Simo Särkkä and Arno Solin (2014). Applied Stochastic Differential Equations. Lecture notes of the course Becs-114.4202 Special Course in Computational Engineering II held in Autumn 2014. (Booklet as PDF, Slides and exercises). (2012 material is here). S. Särkkä (2012). Bayesian Estimation of Time-Varying Systems: Discrete-Time Systems. Lectures notes of the course S-114.4610 held in Spring 2012 (Booklet as PDF, Slides and Exercises). (2011 material is here). Spring 2019: ELEC-E8736 - Basics of MRI (5 p). Spring 2019: ELEC-E8105 - Non-linear filtering and parameter estimation (5 p) L.
Autumn 2018: EEA-EV/CS-EV - Course with Varying Content: Applied Stochastic Differential Equations, Aalto University. Autumn 2018: Tutorial on Bayesian filtering and smoothing methods for machine learning in MLSP 2018 Conference. Spring 2018: ELEC-E8736 - Basics of MRI (5 p). Spring 2018: ELEC-E8105 - Non-linear filtering and parameter estimation (5 p) L.
Spring 2017: ELEC-E8736 - Basics of MRI (5 p). Spring 2017: ELEC-E8105 - Non-linear filtering and parameter estimation (5 p) L.
Autumn 2016: EEA-EV - Course with Varying Content: Applied Stochastic Differential Equations:, Aalto University and Tampere University of Technology. Summer 2016: Tutorial on Introduction to Bayesian filtering and smoothing at Fusion 2016 Conference. Spring 2016: ELEC-E8105 - Non-linear filtering and parameter estimation (5 p) L.
Autumn 2015: Bayesian Filtering and Smoothing, Universidad Tecnológica de Pereira, Colombia. Autumn 2014: Becs-114.4202/Mat-1.C Special Course in Computational Engineering II: Applied Stochastic Differential Equations (3 cr). Autumn 2014: Tutorial on Bayesian Filtering and Smoothing at EUSIPCO'2014 conference in Lisbon/Portugal. Spring 2014: ASE 5036 Optimal Estimation at TUT. Michaelmas 2013: Minicourse on Stochastic Differential Equations in Bayesian Dynamic Models and Machine Learning at University of Oxford, UK. Autumn 2013: Lecture in fMRI school 2013 of O.V. Lounasmaa Laboratory. Summer 2013: Lecture in Gaussian Process Models summer school, University of Sheffield, UK. Spring 2013: Guest lecture on course ASE-5030/6 Optimal estimation at TUT. Spring 2012: Lecture in fMRI school 2012 of O.V. Lounasmaa Laboratory.